The Story of Diva and Flea by Mo Willems. Review: Two worlds collide in The Story of Diva and Flea written by Mo Willems and illustrated by Tony Diterlizzi. Diva is a little dog who is used to life in a home, and Flea, on the other hand, is used to life on the street. But one day they come together and find out that together they can have a lot of fun and they develop a friendship as they discover the world together. The Story of Diva and Flea was written not only for enjoyment, but also to describe the friendship that can develop in spite of differences. This book is recommended for early readers 1st through 3rd graders. Review written by Sabina (6th grade student). 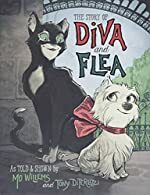 We would like to thank Disney-Hyperion Books for providing a copy of The Story of Diva and Flea for this review. Have you read The Story of Diva and Flea? How would you rate it?